Detail of Esau - Ashburnham Pentateuch, 6th or 7th Century. Bibliothèque nationale de France NAL 2334. Bibliothèque nationale de France, Département des Manuscrits, NAL 2334, folio 25r. Also known as the Tours Pentateuch. This manuscript is probably from the late 6th or early 7th centures (with later additions), but a 5th century date has also been claimed. It was probably made in Roman North Africa, Spain, Syria or provincial Italy. Joseph supervises the harvest in the years of plenty. Pharaoh allowing Joseph to go to Canaan. The Hebrews forced to build an Egyptian city. The Hebrews forced to make bricks. There has been general accord among scholars only with respect to the seventh century dating of the manuscript.3 In endeavoring to fix the place of origin of the manuscript, writers have ranged in suggestions from Spain and Southern France to Italy, Dalmatia and even North Africa. Zimmermann went as far as to ignore the manuscript entirely, since he was unable to place it within the pre-Carolingian tradition.4 Several theories emerged about the manuscript. The followers of Strzygowski5 - Wolff,6 Dalton,7 Woermann8 and Rostovtzeff9 have suggested that the manuscript is based either on a Judaistic Alexandrian model or on one from the Near East, on account of stylistic affinities with Coptic, and particularly Near Eastern works of art. On the other hand, Schultze10 a follower of Springer,11 because of a supposed Germanic element in the manuscript assigns it to a western locality like North Italy or Southern France. Gelbhardt12 and Herbert13 essentially share Springer's opinion, suggesting only Africa as another possible place of origin. The followers of Berger14 - Haseloff,15 Leprieur,16 Beissel,17 Neuss,18 Quentin,19 Pijoan,20 Morey21 and Bordona22 - on the basis of stylistic and paleographic similarities to later Spanish Manuscripts accept a Spanish provenance for the manuscript, with the reservation that the model for the Ashburnham Pentateuch might be of North African or Egyptian origin. Gruneisen,23 Rand24 and Porter25 place the manuscript in the Tours region, because of stylistic affinities with the Carolingian tradition. The recent attempt of Lowe26 to assign the manuscript to Dalmatia on paleographic grounds completes the results of investigations to date. 3 The exceptions to the 7th century dating are: H. Quentin, Memoire sur l'establishment du text de la Vulgate, Rome, 1922, p. 414ff,. who feels the Ashburnham Pentateuch may be as early as the 6th century and W. Grunstein, in Sainte Marie Antique, Rome, 1911, p. 343f., who dates it as late as the 8th century. 4 E. H Zimmermann, Vorkarolingische Miniaturen, Berlin, 1916. 5 J. Strzygowski, Orient oder Rom, Leipzig, 1901, pp. 32-39. 6 O. Wulf, Altchristliche und Byzantinische Kunst, I, Berlin, 1914-1918, p. 30 even suggests that a Syrian painter may have executed the miniatures in a French or N. Italian monastery. 7 O. M. Dalton, Byzantine Art and Archeology, Oxford, 1911, p. 488. 8 K. Woermann, Die Kunst aller Zeiten und Voelker, III, Leipzig, 1918, p. 69. 9 M. I. Rostovtzeff, "Dura and the Problem of Parthian Art,'' Yale Classical Studies, V, (1935), 235. 10 V. Schultze, Archäologie der altchristlichen Kunst, Muenchen, 1895, p. 196. 11 A. Springer, Die Genesisbilder in der Kunst des fruehen Mittelalters, Leipzig, 1884, pp. 632 ff. 12 O van Gebhardt, Miniatures of the Ashburnham Pentateuch, London, 1883, pp. 8-9. 13 J. A. Herbert, Illuminated manuscripts, London, 1911, p. 161. Cf. Strzygowski, op. cit., p. 34, note 2 and p. 38 for a rebuttal of Springer's theory. 14 S. Berger, Histoire de la Vulgale pendant les prémiers siècles du moyen âge, Paris, 1893, pp. 11 ff. 15 A. Haseloff, "Die Vorkarotingische Buchmalerei im Lichte der grossen Veroeffentlichung des Deutschen Vereins,'' Repertorium fuer Kuntswissenschaft, XLII, (1920), 190 ff. 16 As quoted n J. D. Bordona, Spanish Illumination, I, New York, 1948, p. 5. 18 W. Neuss, Die Katalanische Bibelillustration um die Wende des Ersten Jahrtausend und die altspanische Buchmalerei, Leipzig und Bonn, 1922, pp. 59-62. 19 Quentin, op. cit., pp. 414 f.
20 J. Pijoan, Les miniatures de l'Octateuch à les Biblies Romaniques Catalanes, in Institut d'Estudis Catalans, Anuari, 1913, pp. 475 f. assigns the manuscript to Seville. 21 C, Morey, Medieval Art, op. cit., p. 193 and C, Morey, Early Christian Art, Princeton, 1942, p. 179. 22 Bordona, op. cit., pp. 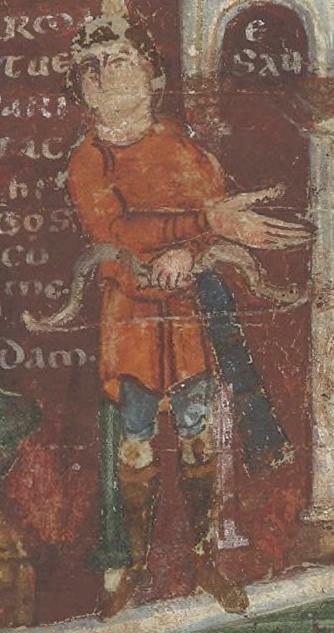 5 f.
23 Gruneisen, op. cit., p. 551. 24 E. K. Rand, A Survey of the Manuscripts of tours, I, Cambridge, 1929, p. 83. 25 A. K. Porter, Spanish Romanesque Sculpture, I, Firenze, 1928, p. 50. 26 E. A. Lowe, Codices Latini Antiquiores, Part V, (France: Paris), Oxford, 1950, p. 49. Lowe states that "the script (of the Ashburnham Pentateuch ) is unicial of a peculiar type; recalls the Valerianus Codex (Munich. Lat. 6224) assigned by some to a Latin speaking region east of Italy."